If you are looking for a gentle and noninvasive technique for supporting feline wellness, look no further than Reiki. Reiki can create relaxation and peace in even the most stressed-out cases-thus it is ideal for cats living in loving homes, as well as shelter and rescued cats. Reiki can help to speed healing after surgery or illness, reduce side-effects of medicine and other treatments, relieve pain, improve behavior problems, heal anxiety-related problems and, when physical healing isn't possible, ease the transition to death. The system of Reiki is Japanese in origin. "Rei" means "spirit," and "Ki" means "energy," so the word "Reiki" literally translates to "spiritual energy." Reiki is also a spiritual practice, albeit one without dogma and beliefs, so it is compatible with any religious philosophy. Your intention and commitment to the "doing" of Reiki (meditation and opening to the flow of energy) is important to your own development and healing, as well as your ability to connect with animals successfully. On a personal level, practicing Reiki can deepen your intuition and cause tremendous internal healing on all levels. Since the way and flow of Reiki is toward perfect energetic balance, it always finds the origin of the problem (since all health problems are "dis-ease" or imbalance) and supports energetic harmony (rebalancing and clearing the energy "flow"). Its harmonic nature also makes Reiki completely safe and ideal for use with other modalities, both conventional and holistic. Cats are especially sensitive to Reiki energy and will benefit greatly from the approach of treating from a distance, meditatively and respectfully "offering" rather than physically and actively "giving" Reiki with physical contact (as is often done in human Reiki treatments). Incorporating this philosophy with all cats, even those comfortable and familiar with humans, results in a greater openness from the animals and thus greater successes in their treatments. Recently, I experienced this firsthand when working with some feral kittens. I placed the chair about 10 feet from their cage. Inside, the two feral kittens, one gray and one black, stared at me, terrified. The black one stood in front of the gray, clearly protecting her little brother. They had been rescued the previous day from a hillside just off the freeway. My friend Janet, who feeds several feral colonies throughout San Francisco and also frequently rescues and gives aid to these kitties, had taken the two kittens into her home until the SPCA could evaluate their adoption potential. Thus far, Janet had been scratched and bitten, and had to wear gloves when reaching into the cage to feed or clean. The other members of her cat family were also very interested in the new arrivals, sitting near the window where the cage was located. One of these cats, Honeydew, had been previously rescued and adopted by Janet from the same colony. Still quite feral, she had hidden herself in another room when I arrived. Before I began the Reiki treatment, I set my intention to offer them some healing, but let go of my expectations about what might happen, understanding that they need only take what they were comfortable with-which may be nothing at all. I visualized myself several feet away from them and not breaching this space. In addition, I avoided eye contact so as not to push any kind of physical connection with them. I closed my eyes, rested my hands on my lap and began to offer Reiki. 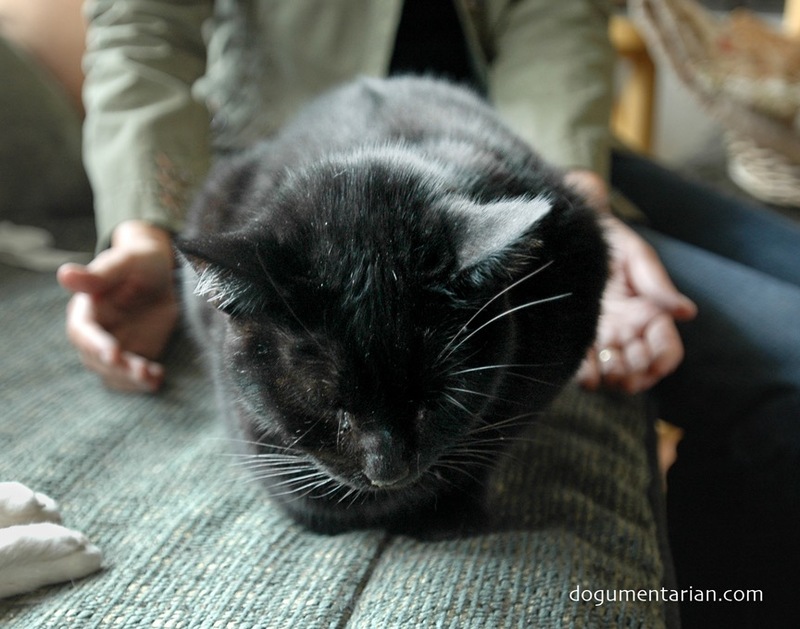 As I began the treatment, which involves simply connecting with the energy and then "holding a healing space" for the cats, I focused on a feeling of peace and tranquility inside myself. It was obvious that the cats were tremendously fearful and stressed, and I knew Reiki would help them relax. I also visualized Janet and what a safe, good person she was. They were in a good place where they would have food and shelter. Although I didn't open my eyes for nearly a half an hour, I felt the energy flow strongly through me as sensations of heat and buzzing through my hands, arms and body. The best description of what it feels like to offer Reiki is what it feels like to be in a deep and peaceful meditation. I knew, because of the strong flow and relaxation I felt, that the kittens were accepting the treatment. At the end of the treatment, when I began to feel the energy dissipate and my mind return from the deep meditation I had entered, I opened my eyes. The two kittens had moved to the front of the cage, closest to me, and fallen fast asleep. In addition, Janet's timid cat Honeydew came out of her place of hiding and was curiously watching me from just a few feet away. As I met eyes with her, she held my gaze quizzically for a long moment, then looked at the kittens, and then back to me. Then she disappeared as silently as she had come. It was as if she was telling me, "I felt the energy, too. Thank you for helping them." Janet had been quietly watching Honeydew's visit from the next room. She smiled wide-eyed at me, amazed at her cat's uncharacteristic behavior, as well as the kittens' relaxed demeanors. In just one treatment, the kittens showed good improvement. As early as the next day, Janet was able to reach into the cage and hold and pet the gray kitten. The black, although still fearful, refrained from attacking her hands. Soon, with continued Reiki, combined with patient work and lots of love from cat socializers, the kittens learned to trust people. Within a few months, "Cody" and "Millie" were adopted into good homes. As this story illustrates, Reiki is safe, gentle and noninvasive. For those of you unfamiliar with energetic therapies, let your cats be your guides: Our feline friends are so much more aware of this subtle energetic communication. See what they think of Reiki, and you never know-you just might find yourself trying a treatment, too!